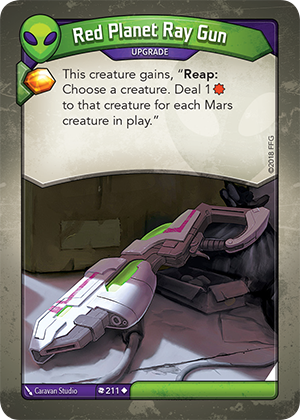 If I place Red Planet Ray Gun on a creature that already has a “Reap:” ability, do I get to use both abilities when that creature reaps? Yes. When a player uses a creature to reap, the player exhausts the creature, gains 1 Æmber for their Æmber pool, and then all “Reap:” abilities on the creature resolve. If there are multiple abilities to resolve for a particular action (such as reap), the active player chooses the order in which those abilities resolve. What if there are no enemy creatures when I reap with my creature who has the Red Planet Ray Gun upgrade? If you reap with this creature and there are no enemy creatures in play, then you must choose a friendly creature to deal damage to. When a creature with Red Planet Ray Gun reaps, do I deal 1 damage for each enemy Mars creature as well? Yes. There is no wording in this ability that limits which Mars creatures are counted (e.g. “each friendly Mars creature”). You deal 1 damage for each Mars creature in play, both friendly and enemy.